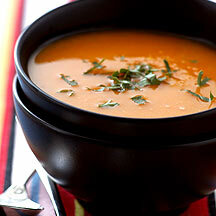 Avoid putting on extra pounds this winter with hearty bowls of soup. Preheat oven to Gas Mark 7/220°C/425°F. Place squash and onion in a large roasting pan. Bake, uncovered, for 45 minutes, until squash is tender. If some of the pieces get a bit browned this will only add to the flavour. Remove from the oven. Tip into saucepan and add stock. Bring up to the boil, reduce heat and simmer for 15 minutes. Let cool (about 15 minutes). Purée in batches in blender or food processor. Toast curry powder in a small frying pan over low heat until fragrant (about 2 minutes). Stir into puréed soup. Garnish with spring onions and serve.